← Favourite subjects versus relevant curriculum? 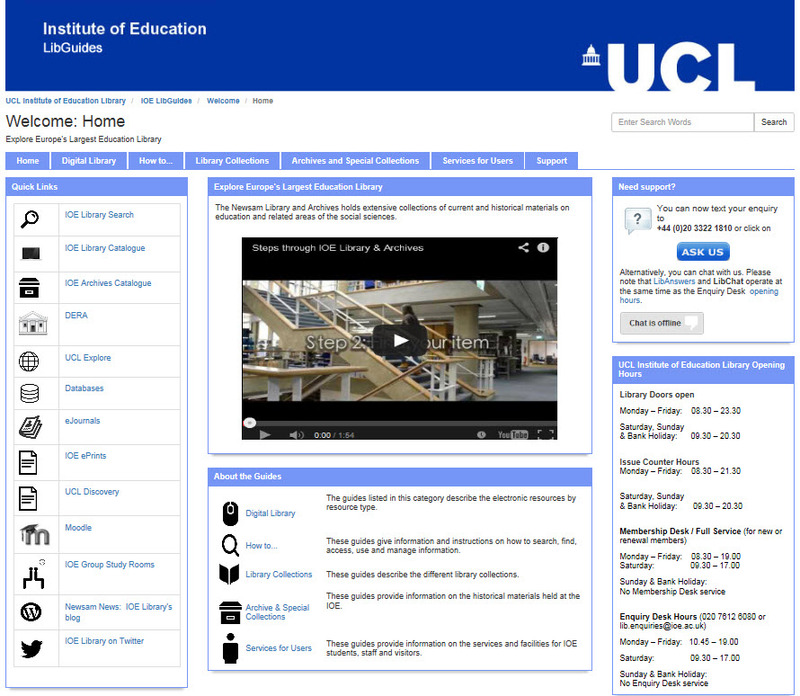 Summer 2016 will be a time of transition at the UCL Institute of Education Library as we aim to enrich the user experience both in the library and online. One key change involves IOE LibGuides. Since 2012, we have used LibGuides to support learning in our face-to-face and online library sessions. We updated our ‘LibGuide look’ in 2014 and in 2016, we’ve been working toward the migration to LibGuides 2.0 on the 1st of June 2016. With LibGuides 2.0 we hope to provide users with enhanced responsiveness and interactivity. You may not find much difference in the way you navigate through the different groups of guides which are arranged in the Digital Library, Library Collections, How to…, Archive & Special Collections and Services for Users, but what you may notice is that the look is slightly different. The navigation remains the same, that is, through the bread-crumb trail at the top left hand side and you can still search for guides. An important enhancement is that LibGuides should display the same on all devices. We have also purchased LibWizard which offers us the tools to create better forms, surveys, quizzes and tutorials. We’ll provide more about that in future blogs. Do bear with us while we work through the LibGuides to ensure that all the guides are accurate and all the links work. If you find any inaccuracies, let us know by sending us a message on IOE LibAnswers. Do also send us your feedback. Are there any new guides that you think would be useful? Are there ways in which we can improve the guides to make the content more accessible? Your input is always appreciated. This entry was posted in Library and Archives and tagged feedback, IOE LibGuides, LibWizard, migration, quizzes. Bookmark the permalink.